Don’t you love when you’re reading an old book & the author wrote it as ‘sirop’? It’s so old timey or foreign. I know sirop is the French way of spelling syrup, but it seems that a lot of books written in the 1700’s or 1800’s write it that way, too. Makes sense since it comes from the Latin ‘siropus.’ But anything written in another language (or in an old way) is more attractive. Like, for example, this recipe would be ‘Sirop de mûres e miel’ in French. So lovely. Are you tired of my history of language lesson yet? 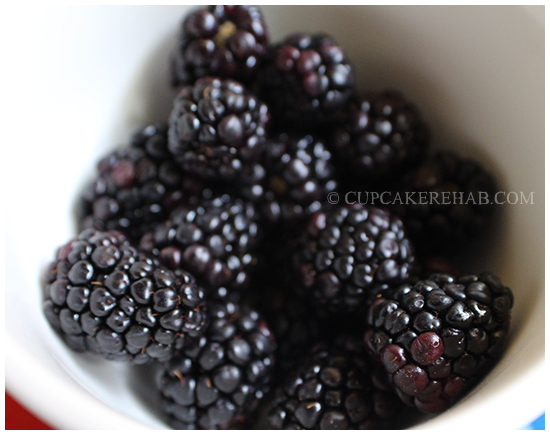 Blackberries always intrigued me. I’m not a fan of the flavor of berries, let’s just get that out in the open right now. I can tolerate strawberries, but I’m not a huge fan by any means. I’m a big apple girl (both figuratively & literally- I ♥ NY, too) and I love citrus. Berries? Nah. Not for me. But regardless, I love looking at them, touching them, cooking with them. I come from a family of berry fiends… which is good, because I get to satisfy my curiosity without wasting food. I didn’t grow up near a blackberry bramble. There are no wild berries growing in my yard, however we did have a flowering crabapple tree. My berry encounters were not on a farm or in the wild country, but supermarkets & restaurants & as the flavoring in gum. Blue raspberry anything still makes me queasy to this day, by the way. I came up with this idea because after finishing that blackberry whateveryouwannacallit thing I made, I had some blackberries left over. Not enough to make into a jam, really, unless I made about 4 ounces, and that’s not really worth the trouble. It was pretty much a decent-sized handful of big, juicy berries. And blackberries don’t last long, as you probably know. So I figured I’d make them into a syrup using some honey. I didn’t use a recipe, so I honestly have no idea what measurements to tell you to use. You aren’t going to be canning this; it’s just for immediate use or storage in the refrigerator, so there’s no concern about adding acidity or the amount of sugar, etc. The more honey you add, the more syrup you’ll get. The more berries you add, the more syrup you’ll get. I made it about even, which gives a stronger berry flavor. If you have more honey than berry, the flavor will be more honey & vice versa. You get the idea. You can use it for pancakes/waffles, you can stir a little bit into some lemonade & toss in some whole berries for a nice summer drink or use it as the base for a cocktail. I’m sure a lighter bourbon like Basil Hayden’s would be interesting mixed with a bit of this. Also, use it as a salad dressing base: mix it with a little red wine vinegar & olive oil, you’ve got yourself a blackberry honey vinaigrette. Even better, mix it with some blackberry vinegar, if you’ve got it. I rinsed off & dried the berries. Only do this right before using them, or else you’ll end up with moldy fruit. I put the clean fruit into a medium saucepan and mashed them with a fork. It’s not necessary to make sure they’re completely smooshed- just enough to release a bit of juice. I added about a half cup of honey (more is fine), and turned on the heat to medium-low, stirring with a wooden spoon so nothing scorches. Keep stirring and gently mashing the berries, incorporating them with the honey. The mixture should be a reddish color now. Keep cooking & stirring. Cook, stirring pretty frequently, until it’s reduced & thickened slightly, and it’s a dark, foamy syrup with little round berry bits & guts in it. Don’t worry, you’re straining that out. Add a dash of pure vanilla extract and stir well. Almond extract works too, but nothing at all is fine. The blackberry honey flavor is enough! 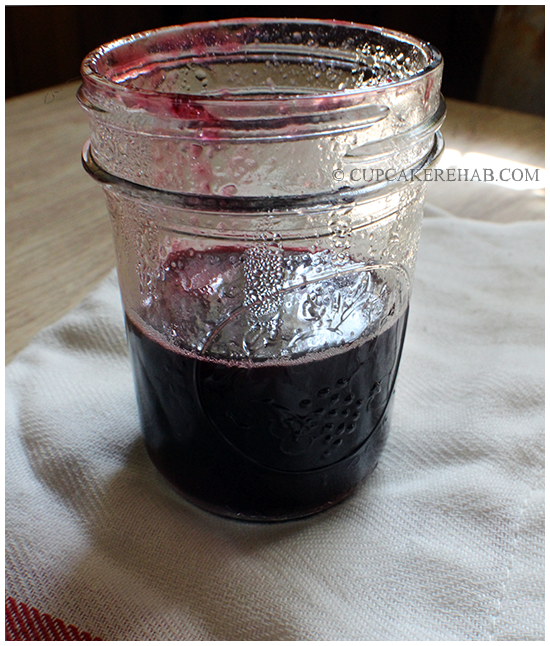 Clean a jar, put it on a tea towel on your counter or table and place a strainer over the top. 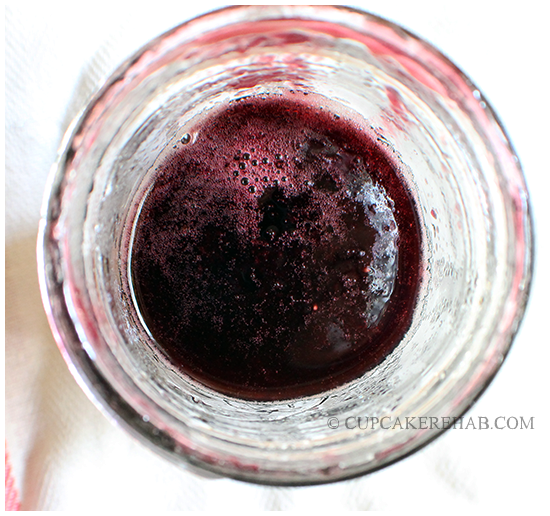 Depending on the amount of berries/honey you’re using, you might need a pint jar. Pour the mixture into the strainer little by little, pressing down with a rubber spatula to extract more syrup. When all the syrup is out of it, scoop it into the garbage and pour more of the mixture in, then repeat. Once you’re finished, place a lid on the jar and let it cool. Once cooled, refrigerate or use immediately. 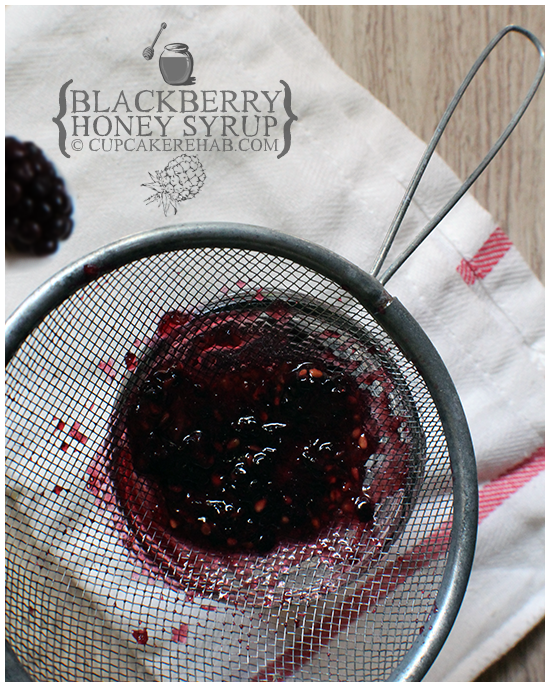 It’s insanely simple, and it makes use of even the smallest amount of leftover blackberries. I’m pretty sure it would work with blueberries or raspberries as well. Previous Post I like cupcakes & I don’t care if you don’t. Next Post Enter the Tiki Room- a Sourpuss giveaway!